Purple K Fire extinguishers contain a dry chemical, known as Potassium Bicarbonate, which is effective in extinguishing Class B and Class C fires. Class B and C fires are common in gas stations, power plants, bars, auto repair shops, airports or aircraft service stations, industrial kitchens, warehouses, and any other area where electrical or flammable fires may occur. Purple K fire extinguishers are not designed to be used in extinguished fires on sensitive computer equipment or in server rooms. This is due to the dry chemical extinguishing agent being harmful to the electrical equipment. For electrical fires that involve sensitive electrical equipment it is best to use “Clean Agent Fire Extinguishers”, such as Halotron fire extinguishers. NOTE: While the name would tend to imply, Purple K fire extinguishers are not effective in extinguishing Class K fires. Class B fires consist of the burning of flammable liquids or gasses such as petroleum greases, oil-based paints, tars, alcohol, and some solvents. Class B fires are common in the petroleum industry and in kitchens of homes where grease and cooking oils may catch fire. NOTE: Water should never be used to on Class B fires. Class C fires, also known as “energized electrical fires”, are fires that have a power source. Some examples of Class C fires are electrical outlets and cords, home appliances, electrical panel boxes, servers, motors, power tools, computers, and any other source that may be energized or electrical. Note: By removing the power or energized electrical source, the fire is then no longer considered a Class C fire, but rather a Class A or B fire depending on the fuel source that is still burning. If you would like to read more about portable fire extinguishers, check out our other articles titled: “Understanding Portable Fire Extinguishers – Use and Limitations”, “How to Operate a Fire Extinguisher”, or “Types of Fire Extinguishers and Their Uses”. OnlineSafetyDepot.com carries Portable Purple K fire extinguishers. 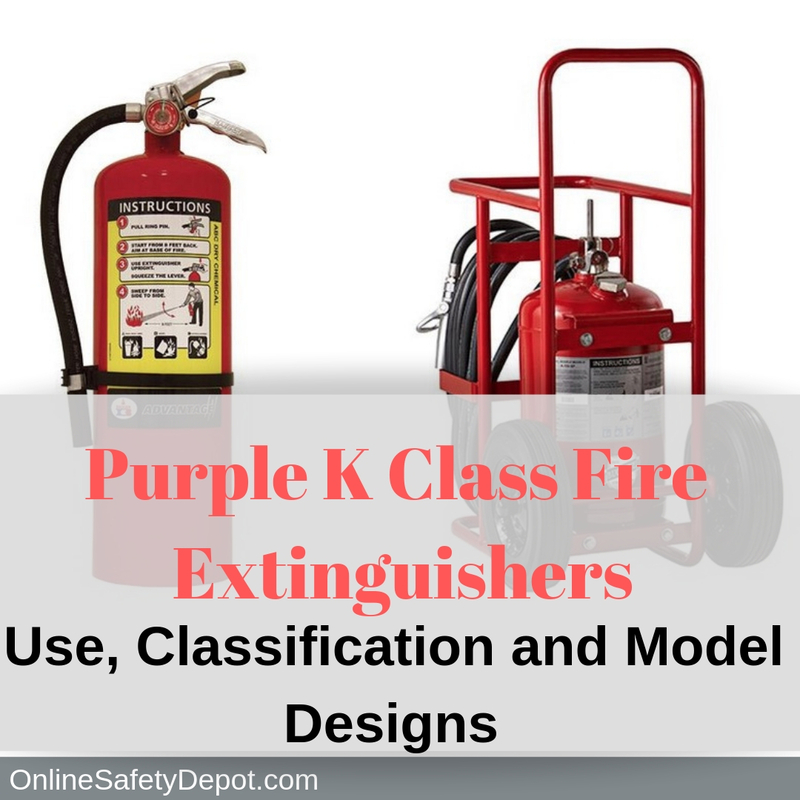 Purple K Wheeled fire extinguishers are designed for industrial settings such as auto shops that have multiple cars in the same garage, airplane hangars, airplane repair shops, or airports where larger fires may occur to be able to cover a larger area. Offshore fire extinguishers are designed to withstand the harsh environmental conditions that are found along the coast, boat docks, or oil rigs. Each offshore fire extinguisher is coated with several specially designed paint coats to prevent damage caused by water, salt and sun that can lead to rust and destroy the mechanics and innerworkings of the fire extinguisher, and possibly render it insufficient when needed in an emergency. OnlineSafetyDepot.com offers Offshore Purple K Class fire extinguishers. We invite you to check out our extensive line of highest quality fire extinguishers for your home, business, or offshore fire protection plan requirements.